If you’re a texter, you’ll love Messages on iPhone, iPad, and iPod touch. Now they all come with iMessage, a service that’s an even better kind of texting. Because it’s free for you and anyone texting over Wi-Fi using an iOS device or Mac with iMessage. And it’s unlimited. So say as much as you want. iMessage is accessible through the Messages app on an iPhone, iPad or iPod touch running iOS 5 or later or on a Mac running OS X Mountain Lion or later. For users who have an active data connection, Messages will check with Apple if the recipient has iMessage set up. If so, Messages will seamlessly transition from SMS to iMessage. The recipient must use an Apple device as iMessage is an Apple service and not based on services of your carrier. iMessage is not tied to a particular device or SIM card – it uses an Apple ID. Consequently the Apple ID you entered during the device set-up phase will be the one used for iMessage by default. The Apple ID can be changed from within the Settings app, but more importantly you can also set up “proxy” E-Mail addresses through which you can receive iMessages. These proxy addresses act as gateways through which iMessages can be funneled into your Apple ID, which is what actually stores your messages. If you have an iPhone your phone number is also added automatically to this list of “proxies”. A PROXY is a computer system or an application that acts as an intermediary for requests. Servers of your provider for example are proxies as they receive information and send them to you. If you don’t have a SIM card inserted (e.g. in an iPad) iMessages can be sent from your device if you are connected to the internet. But if the recipient cannot receive iMessages you cannot contact him via Apple’s Messages because automatic switching from iMessage to SMS service is only possible with a SIM card. During activating iMessage there are several messages coming up which I don’t describe here because they are self-explaining. A popover with your Apple ID comes up. If you activate iMessage Apple will send a confirmation for your phone number to the UK (+44 7786205094) to register this phone number in the global catalog for iMessage capable devices. You have to pay the normal fee for this SMS. In Germany its 0.28€. From then on your phone number and your Apple ID are used for iMessage. If you use further Apple devices all the information is pushed to them. So you just have to turn on iMessage on other devices. The whole procedure is also valid for Facetime activation. You may add further E-Mail addresses. Each entry will be verified by Apple through sending an E-Mail to this address. It contains a link ‘Verify E-Mail’ for verifying this particular address. 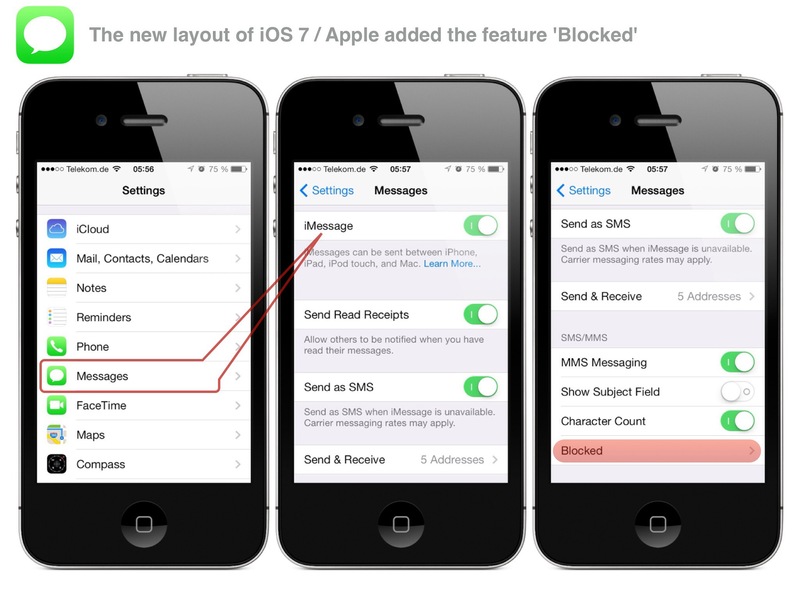 Wit the release of iOS 7 in Sep 2013 Apple adapted just the layout of iMessage and added the new feature ‘Blocked’ with which you can choose a contact from ‘Contacts’ and block any iMessage communication with selected people. The whole setup procedure, the system behavior, and the restrictions remained the same. iMessage is still not available for establishing connections with devices of other vendors. This is quite understandable because it’s an Apple service and requires an Apple ID. If the recipient does not use iMessage (because he owns no Apple device, deactivated iMessage or cannot connect to the internet) your message will be sent as a usual SMS unless you turned off the option ‘Send as SMS’ in Setting – Messages. 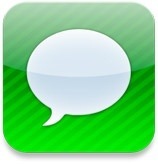 On your screen iMessages you sent to the recipient appear in a blue, usual SMS in a green bubble. With iMessage you can send file attachments like photos, screenshots and videos. When using WiFi videos are compressed to 360 x 480 pixels and cannot exceed 100 MB. If you use the Cellular 3G connection the quality of videos is strongly reduced. A video should not be longer than 90 sec. If you select more than one recipient to send your message to iMessage starts a group chat. All consecutive messages are sent to all members of the group chat. Within a running chat single members cannot be excluded. If an iMessage cannot be sent double tap the message and select ‘Send as SMS’ from the context menu. You may also let iMessage do this automatically if you go to Settings – Messages and turn on ‘Send as SMS’. Carrier messaging rates may apply. A message with more than 960 characters will be cut into pieces. Each part contains up to 960 characters. The maximum length is 4000 characters. You can activate ‘Character Count’ in Settings – Messages to see the length of your message. Messages sent via iMessage are unlike usual SMSs Point-to-Point encrypted. To my state of knowledge Apple did not publish details of the encryption protocol. Corporate security is compromised when users who rely on iMessage are unable to transmit messages via Apple’s platform, as iMessage may revert to sending a regular unencrypted text message (SMS). A single finger swipe allows users to exchange public encryption keys, encrypt text messages, and protect text, audio, video, and picture messages from eavesdroppers by going through a carrier-based network instead of through the cloud. A ‘Delivered’ note next to each message indicates a successful delivery and there is also the option of sending ‘Send Read Receipts’ – these simply allow the other persons sending an iMessage to know that you have read their message. Tap on the Edit icon of an iMessage to forward a message or delete it. During a conversation iMessage displays a bubble with three points when your partner edits his new message. A profile for iOS devices is available for logging all iMessages on the device. The installation is on one’s own responsibility. 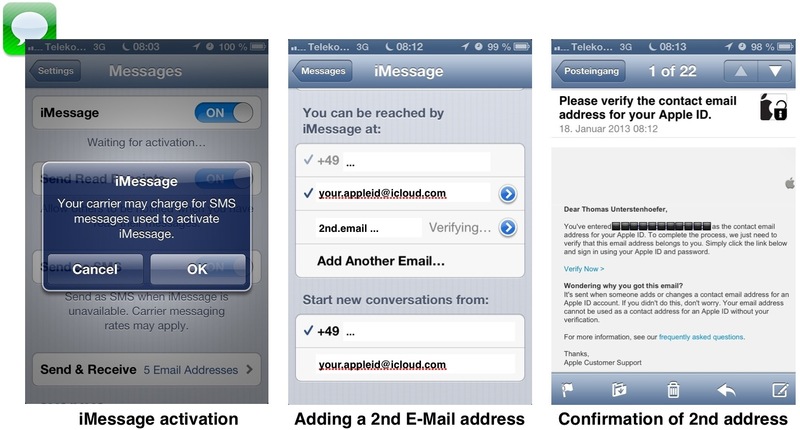 iMessages reach the recipient meanly within 2 sec while an SMS usually needs 5 sec. Go to Settings – Notifications – Messages and use appropriate settings for notifications. If you only want to be informed about an incoming iMessage in the Lock Screen turn off ‘Show Preview’. iMessages are automatically pushed to all your other iOS-Devices where iMessage is activated. If you frequently visit foreign countries the use of a local SIM may save costs. But what happens with iMessage? As iMessage is not carrier-based you must not do anything. Your phone number is admittedly different from that you used when activating iMessage. But your Apple ID remains the same and is alternatively used when your phone number has changed. But keep in mind that in this case iMessage only works with an internet connection because your new local phone number is not registered in Apple’s iMessage address pool. Please comment or use the contact form on the ‘About’ page. With positive comments you feed the blogger, with negative comments you goose him to improve the quality.